Hi all! I'm Andi, DD#1. A little about me: I'm a bit of a fabric hoarder, I LOVE coupons and getting things for free, I've been married almost 2 years now, and I love making things - all sorts of things. I've been working on a variety of projects lately, as usual. I can never seem to work on just one thing at a time. My older sister just had a birthday and has a baby shower coming up this weekend so those have been the reason for of some of the projects. The first project is a covered baby wipes container. I forgot to take before pictures but I'm pretty sure most of us know what a baby wipes container looks like. I measured and cut a fat quarter to be the size of the container. Then I applied Mod Podge to the container and pasted the fabric on. After it dried, I hot glued the braided cord around the edge and painted the cute sports designs on the top with acrylic and Tulip paints. I like the way it looks and hopefully she won't see this post before the shower. For her birthday (and for myself) I made a dry erase menu board. This is possibly my favorite project I have made so far. Try it, you'll love it. I bought a couple of 8x10 picture frames (you can get great ones at the dollar store or on clearance at Target sometimes) with the easel back. I used scrapbook paper that I had on hand and cut it down to 8x10. In Microsoft Word, I typed up the Weekly Menu and then printed it out on the decorative paper. The first one was a bust because I used some paper that looked like notebook paper and forgot to make sure that it was lined up correctly. So, the next ones I made I just used pretty paper that didn't need to be so perfect. My sister loved it and my husband loves ours too. It makes planning grocery shopping so much easier now because we plan out the whole weeks menu first. There are more projects to come! This free sock pattern published by Martingale & Company on Facebook. I have wanted to try making socks but I'm not a fast knitter, so when I saw a cute crocheted sock pattern, I jumped! I took my Joann's gift card from Christmas and bought sock yarn and the right size hooks. Yes, I probably had the right size hooks but I don't remember where I decided was the perfect place to store them when we moved in here almost a year ago. Pretty purple wool & bamboo blend yarn that feels so soft! And am I using that yarn to try my first sock? No! I was afraid of the gauge being too small and I can't visualize crochet in progress like I do with fabric, so I went with a skein I had on hand, this pink camo. Is a girl ever to old to wear pink camo socks? I thought not! This is the upper part of the first sock and I like it so far. I stopped to I could measure last night. I can probably get half the foot done today while watching movies. 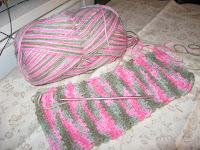 I'm making the largest sock, although I'm not sure if the number they use refers to shoe size or inches. Here again, this is why I'm using the acrylic skein on hand rather than the $5.99 (on sale for $4.99 this weekend at Joann's) bamboo/wool. The bamboo/wool balls are half the size of the camo, which means my pair of bamboo/wool socks will cost about $10. I don't recall what the acrylic ran (or where I bought it, darn it all!) but I'm guessing half of that. If these socks turn out well I can easily see this being a new favorite hobby (I was going to say habit). Easy to take to craft night, easy to store in my room and takes up almost no space! 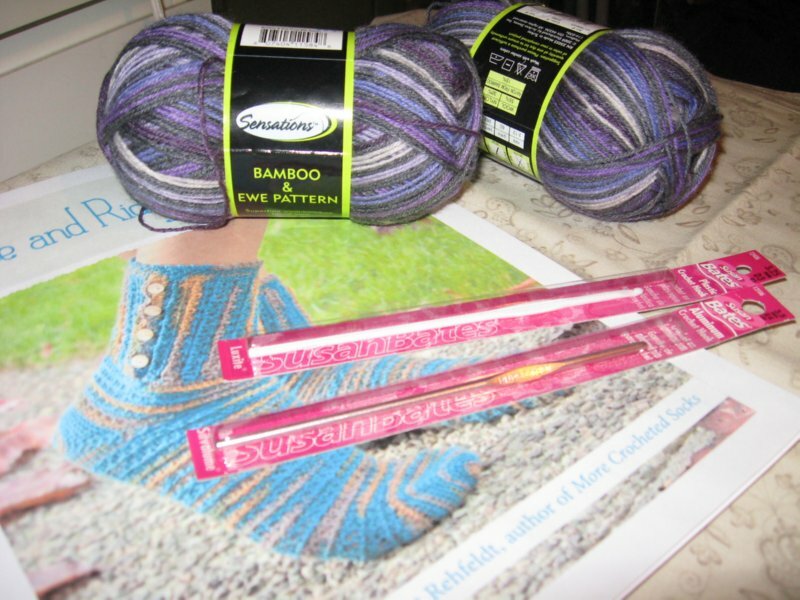 I'll never give up quilting and sewing, but I might get it under control this year if I buy sock yarn instead of fabric. Whatcha think? My daughters and I are crazy about crafting, mostly sewing, quilting and crochet. This blog talks about what we're working on and the life of a crafter.